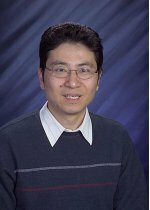 Congratulations to Dr. Xiaohong Liu, atmospheric scientist at Pacific Northwest National Laboratory, who was appointed to the editorial board of Atmospheric Chemistry and Physics (ACP) in January 2013. As an editor, he will use his research expertise on global and regional modeling of atmospheric aerosols and aerosol-cloud-precipitation interactions to review manuscripts submitted to the journal. Liu is also a frequent contributor to the journal. Discussing high-quality studies that investigate the Earth's atmosphere and underlying chemical and physical processes, the journal covers topics such as atmospheric modeling, field measurements, remote sensing, and laboratory studies of gases, aerosols, clouds and precipitation. ACP is published on behalf of the European Geosciences Union. Liu was chosen for his exceptional research on modeling of atmospheric aerosols, and their direct and indirect effects on global and regional climate. At PNNL, his research is focused on modeling, sub-scale parameterizations of cloud microphysics, cloud-aerosol interactions and their applications in global and regional models. The parameterizations have been implemented in several major climate models for the assessment and projection of climate change. Liu is an active member of the America Geophysical Union and American Meteorological Society.